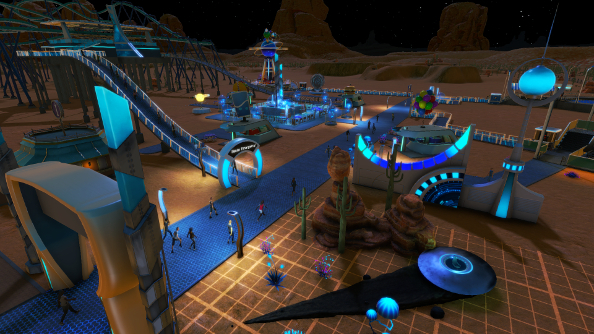 RollerCoaster Tycoon World finds itself in the unenviable position of launching on Steam Early Access after a string of exceptionally poor Atari releases, all resurrected and once beloved franchises, like Alone in the Dark, that don’t remotely stack up to their originals. And one of the worst offenders was the mobile version of this very game: a mess of an app, heavy with microtransactions, and best avoided. If you’re on the lookout for more management sims, check out our list of the best strategy games on PC. RollerCoaster Tycoon World is a very different beast, however, and the only similarities between this and the mobile game is the name. 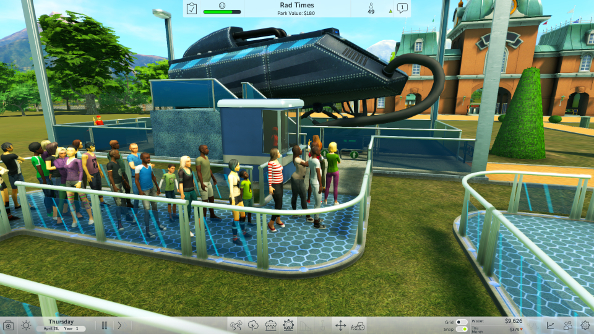 This is a fully-fledged PC title with a great deal of customisation, zero microtransactions, and is worlds away from the cynical cash-in that the RollerCoaster Tycoon Mobile proved to be. Yet there remains a lot of room for improvement. 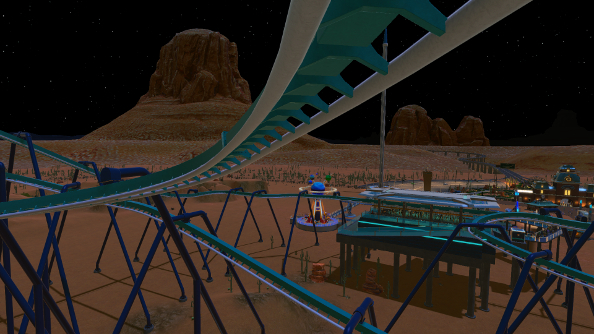 If you spent the late ‘90s and early 2000s in a joyless, coaster-less nightmare, here’s the skinny: the RollerCoaster Tycoon series, originally developed by Chris Sawyer and MicroProse until the reins were handed to Frontier Developments of Elite: Dangerous fame (they’re now working on the competition, Planet Coaster), gives you control over an entire theme park. Mess around with the budget, provide services for customers, build new attractions and, most importantly, construct elaborate rollercoasters. RTW offers much of the same, with varying degrees of success. Even in this Early Access stage, however, it’s jam-packed with content, with Nvizzio Creations promising a lot more in future updates. What you can do right now is embark on a campaign, various scenarios and a sandbox mode (complete with unlimited funds if you don’t want to be hampered by your wallet) with a few predictable terrain options like forest or desert locations. Once you’ve opened your park, you can plonk down anything from pirate-themed burger joints to wild west rides for kiddies and, of course, a multitude of rollercoasters. At the moment, there are 35 rides to choose from – not including the coasters – that run the gamut from the classic Helter Skelter to a Star Tours knock-off. This already robust list of attractions is broken up into family rides, thrill rides and junior rides, making it easy to tailor the park or an area for specific types of people. They’re split up into themes, as well, like sci-fi, the wild west and pirates. This thematic customisation is already surprisingly deep: you’re not just plonking down space rides, but placing restaurants, gift shops, benches, decor and even bins that all have a campy sci-fi bent. And this isn’t purely cosmetic, either, as customers have a long list of preferences and may prefer sci-fi over high seas shenanigans. These preferences extend beyond the park themes, too, as you’ll encounter customers who don’t enjoy Mexican food or have an abiding love for sushi. Good thing that there’s a ridiculous number of restaurants, then. It’s just a shame that there’s little you can do with the basic rides once they’ve been built, aside from changing ticket prices. You can’t dictate how much you want to spend on their maintenance, how fast they go, or how intense they are. Indeed, you have more control over the queues than the rides themselves. 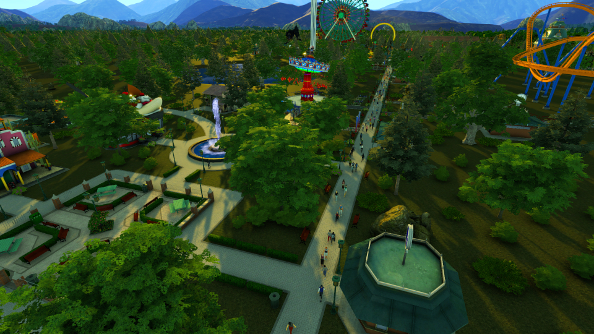 The actual act of building the park is fairly simple, and benefits from things like customisable paths where you can select not only cosmetic details – yes, even the paths have themes – but also choose different widths and elevation. There’s the option to use snapping and grid tools as well as free form placement of objects and paths, but using any of these methods can sometimes being a bit fidgety, as the game sometimes decides that they can’t be placed where you want them to be, without explaining exactly why. Aside from being forced to make the occasional tweaks, however, it’s largely a stress-free affair, and some niggles don’t detract from the commendable flexibility. Okay – let’s talk rollercoasters. This is RTW’s main draw, and hooray! It’s great. If you’re lazy, you can plonk down some prefabricated rides or download them from Steam Workshop – there are a lot to browse already – but the real joy of RTW comes from designing your own nauseating deathtrap. It’s almost stupidly easy to design your own roller coaster, but the real challenge comes from making it… well, work. See, you can make your vomit comet as ridiculous, dangerous and ill-advised as you want with surprisingly few restrictions, but chances are when you hit that test button the cars are either going to stall, or go flying off the track and explode. It’s very satisfying, realising that you’ve just created some sort of colourful torture device that will inevitably end in your customers’ deaths, but it’s probably not a great way to make money. Conveniently, in the testing phase, RTW makes it pretty clear what the problem is, where it is, and how it might be solved. Cars flying off the track? Well the problem is likely to be an issue of speed. Indeed, you can see exactly how far the cars will go at any point of the track, and to make it clearer, the danger levels are colour-coded. Thankfully, few problems actually necessitate rebuilding all or any specific part of the ride. If the cars are hurtling around a bend at 75 kph, then you can simply add brakes or friction to slow them down. You can even select just how much braking power or friction these parts of the tracks contain. If your roller coaster has the opposite problem, and the cars are getting stuck on a steep incline because they aren’t moving fast enough, there are ways to fix that too, using a chain that pulls them up, or boosters that confer greater speeds. When you’re laying out the ride, you’re creating nodes. Build a long piece of track that rises up vertically into a tight curve, and that’s a specific node that you can customise later. But when you select that node to edit it, any mechanisms you place, like boosters, will be put on the entire node. You might not want that. You might want a booster at the top and a chain at the bottom. That’s not a problem, though, because with a simple click, you can create a new, smaller node, and then another, and then apply the mechanisms. This extends beyond mechanisms, so you can change the pitch and yaw of every tiny part of the track. 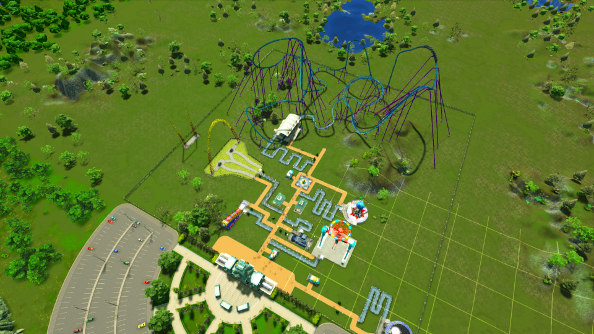 RTW might very well have the best roller coaster editor in any theme park sim – it’s incredibly easy to use but is fit to burst when it comes to customisation options, though aside from some fancy-looking cars and colour changes, there’s still a bit of room for more cosmetic editing. It’s ripe for experimentation, but the depth doesn’t come with a large degree of fiddliness. Ultimately, it’s a delight to use. So clearly I’m a fan, yet you might be able to tell there’s a but coming. Unfortunately, RTW is, in its current state, a pretty poor, barebones management game, rife with AI problems. Customers complain about problems that don’t exist, but their dissatisfaction doesn’t have a noticeable impact until things get really bad; park staff are clueless automatons who will often ignore issues in their wheelhouse, and there’s seemingly no way to designate areas for them to work in; rides break down at the drop of a hat, and it doesn’t seem to have anything to do with how often they are used; and there’s simply not much management for park owners to actually do. Once you stop building rides and fiddling around with roller coasters, RTW becomes a fairly dull affair. You can change the ticket prices, take out loans and set up marketing campaigns, but it never really feels like you need to solve any problems. The issues that do crop up tend to be bugs or AI problems, not things that players need to figure out. For instance, there’s nothing you can do to stop things from breaking down, even if you have an army of mechanics on the payroll, so you just have to wait for rides to stop working and watch as your staff eventually fixes them. There’s no way to solve the problem before it gets to that point. Performance is another area that clearly needs a lot of work, but that’s only a surprise because RTW looks like a five-year-old game that someone’s added overzealous depth of field to. Optimisation tends to be the last thing to be fixed in Early Access games, but I really didn’t expect it to be as poor as it is given the minimum requirements, default settings, and my more than capable rig (Intel i5-3570K @3.40 GHz, 8 GB of RAM, GeForce GTX 970, Windows 10). And then we get to the UI, which for a management game – even one that’s weirdly light on management – is absolutely garbage. Big, unwieldy, ugly and not particularly helpful, it gets in the way rather than assisting, obscuring the game whenever an oversized window is summoned. And God forbid you want to filter information or use a search feature. 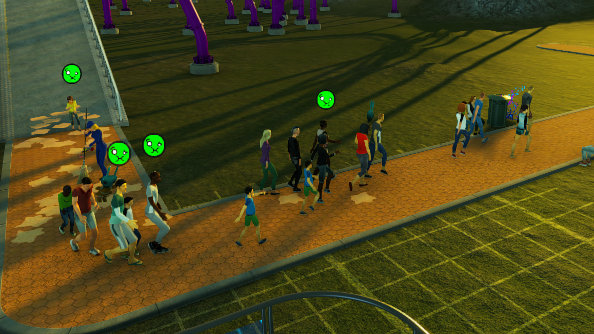 RollerCoaster Tycoon World feels like half of a good game. The construction side of things, though not perfect, is well on its way to being great, and coaster creation is already fantastic. If the RollerCoaster part of the title is the most important thing to you, then you’ll probably be able to squeeze a lot of enjoyment out of RTW, even in its infant form. If you care at all about the Tycoon part, however, you’ll no doubt be left incredibly disappointed. It’s already seen two updates, though, and feedback seems to have been taken seriously so far, so RTW is absolutely worth keeping an eye on.